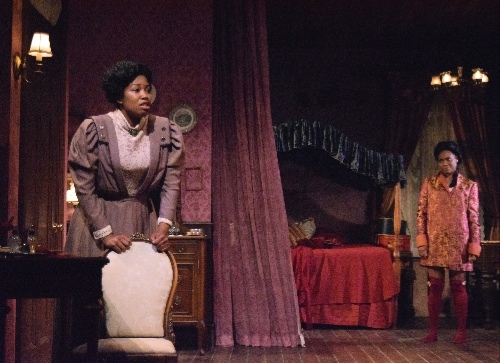 Intimate Apparel, by Lynn Nottage, now playing at the Dorset Theatre Festival, is a play with a simple, unsurprising plot that is rich in levels of meaning and in the depth of its characters. Its very name and the names of the characters allude to significant elements within the story. “Intimate” in addition to referring to the personal and private nature of the lingerie that the main character creates for a living, is defined as communicating delicately and indirectly. It is also used to describe warm friendships developed through long association. All three definitions are exemplified in this play. The word “apparel” is equally complex, meaning clothing but also superficial appearance, adornment and, most interestingly, embellishment, in the sense of embellishing the truth. The name of the main character, Esther, brings to mind the Book of Esther in the Hebrew Bible and so the feast of Purim, based on the Book of Esther, which is celebrated with the donning of masks and costumes. 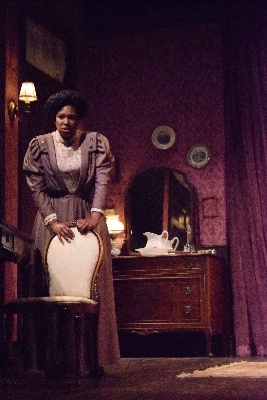 Primarily set in three bedrooms in New York City in 1905, Intimate Apparel is the story of Esther, a black woman, a seamstress who sews lingerie for rich uptown white ladies and also for downtown’s black ladies of the night. Esther is a plain, respectable Christian woman, who has lived for 17 years in a women’s boarding house and has just turned 35. She has watched one woman after another marry and leave the house and fears she is destined for spinsterhood when she receives an unexpected letter. It is from a man working on the Panama Canal who wants to correspond with her. Against the advice of her sensible landlady, Mrs. Dickson, she decides to answer it. Unable to read, she accepts the offer of a rich white customer, Mrs. Van Buren, to write letters for her; and so begins a long-distant courtship with George Armstrong, from Barbados. Throughout the time of her correspondence with George, Esther continues to purchase fabric for the beautiful lingerie from a Jewish merchant, Mr. Marks, a sensitive and gentle man. The warmth between them is as obvious as is the seeming impossibility of a deeper relationship. Through Esther's various relationships, including her marriage to George, the play explores race, gender, friendship, dreams, and how they are all shaped by the constraints of society and the times in which we live. The Dorset’s production is superb. Director Giovanna Sardelli’s hand can be seen in the realistic tight ensemble acting and the simple blocking that makes excellent use of the space. Marinda Anderson’s Esther is warm and sensible, a woman with her feet on the ground, but whose dreams sustain her. She conveys a wide range of emotions from somber through light-heartedness, calm acceptance, and anguish. Chantal Jean-Pierre, as Esther’s downtown client. Mayme, is bawdy and bold. Charles Socarides is a self-deprecating Mr. Marks, who quietly expresses an enthusiasm that he shares with Esther for the beauty of the fabrics he sells. Janie Brookshire as Mrs. Van Buren exhibits an appropriately shallow desperation. Avery Glymph as George moves from a thinly disguised impatience to careless selfishness as befits the nature of the character. Mrs. Dickson, Esther’s landlady, played by Elain Graham, is motherly, a level-headed woman who meets the real world straight on. A single cleverly designed and beautiful rose-hued set, designed by Andrew Boyce with Michael Giannitti providing lighting design, uses lighting, levels, multiple entrances, and a gauzy, scrim-like curtain to serve for all the scenes. Sydney Maresca’s excellent costumes make a significant contribution by accurately depicting the era and the broad variety of characters and of their development throughout the play. Esther’s gentle transition from sensible grays and browns to the warmth of an orchid ensemble of a married woman evokes maturity. George’s attire evolves from tropical laborer, through awkward country suits, and on to a well-tailored man of the city. Mrs. Dickson’s varied outfits run the gamut from that of a contented and successful matron and landlady to that of a bold and colorful woman enjoying life. The flamboyant lingerie and colorful stockings of Esther’s clients are just right for the characters and give evidence of Esther’s considerable skills as a seamstress. 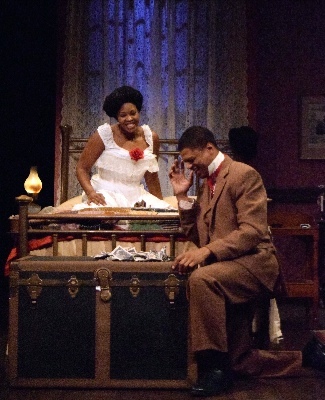 This production of Intimate Apparel is not only an enjoyable evening but it does justice to a fine, multi-layered play that explores the constraints of race and gender, and of marriage and the roles of women in America at the beginning of the twentieth century. It depicts and honors the lives they carved out for themselves in the world in which they lived.